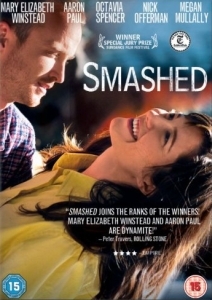 James Ponsoldt’s sophomore feature Smashed (2012) stars Mary Elizabeth Winstead and Aaron Paul, and ambitiously attempts to portray the tragedy of alcohol addiction at its most rawest. Kate (Winstead) and Charlie (Paul) are a young married couple in love, bonding over their mutual passion for music, laughter and above all else, booze. Each night they down endless glasses of wine and bottles of beer (even in the shower), eventually causing Kate’s life to spin out of control and compromising her job as a second grade school teacher. Desperate, she finally confronts her addiction, but on the road to recovery there are unexpected prices to pay. Winstead, after starring in Scott Pilgrim vs. the World (2010) and Die Hard 4.0 (2007), finally gets a more challenging role to demonstrate her very apparent skill. She convincingly portrays a rock-bottom wino, as she pees on the floor of a convenience store and surreptitiously sips whiskey before class. Making Kate a schoolteacher was a sensible move by Ponsoldt, showing both her articulation and intelligence contrasted with the brutality and anger of her drunken rampages. Her destructive relationship with petulant rich boy and wholly unsympathetic Charlie provides much of the screeching drama. Initially, we’re provided with handheld shots of the soused couple whimsically riding their bicycles down the highway and laughing in pool halls. But when Kate kicks the booze, Charlie’s selfish side is revealed as he fails to give the much-needed support during her recovery. Their increasingly fraught relationship shows signs of cracking up as Kate turns instead to her fellow AA members, including The Help’s (2011) Octavia Spencer in a thankless role as her kindly sponsor. A further attempt to amplify the dramatic tension comes in the form of an inelegantly portrayed, half-baked love triangle with fellow teacher and nine years dry, Dave (Nick Offerman). Smashed is weakly developed and seems to have been included for comic relief, but strikes the wrong note with an overly crude chat up line that is completely at odds with the movie. Ponsoldt should be commended for tackling such complex subject matter as he navigates through a morbid and tragic world of alcohol addiction. Sadly, Smashed becomes a sink-hole of gloom where even the hopeful scenes are laced with melancholy. Worse still, he makes the mistake of becoming preachy and overt in his morality lesson, which comes across as a clumsy ‘Don’t drink or you will become an alcoholic’ platitude. This overly simplistic approach destroys much of the quality of the performances and the noble aim of trying to relate a tale about the impact of negative relationships with alcohol. Irritatingly this message is almost completely lost by Ponsoldt’s proselytising approach. There’s a lot here to admire and it entertains for the most part, but the heavy-handed approach is itself enough to make you reach for the nearest bottle. Smashed may be very ‘honest’, but feeding us the odd white lie and glimmer of hope, however unrealistic, makes for a much more successful story.